Equips students to understand the manipulation and understanding of units using the two most widely used methods of measure. Standard units are provided first, with the metric units in parentheses. Up-to-date Formwork table - Provided by the American Concrete Institute . Offers students the most current material available. Heavy equipment data and hauling capacities - Reworked in standard and metric units. Features thorough coverage of material for students and instructors. Photographs and detail drawings throughout. Illustrates for students the concepts under discussion. Logical framework.Focuses on construction processes and the properties of materials, followed by an individual discussion of the most widely used materials. Provides students with a non-intimidating overview of construction processes. Current construction techniques - Illustrated and described. Offers students an inside look at how construction techniques are influenced by the materials and products that are being used. Materials used in heavy construction - Discusses materials, their properties,and the tests performed on them to ensure suitable performance of the final product. 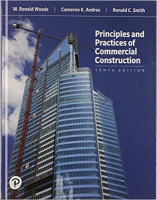 Provides students with an in-depth look at the materials used in the construction of commercial buildings. Reference standards - Established by both the American Society for Testing Materials and the American Concrete Institute . Assures students that text material meets standards of industry professionals. Tests for ACI Concrete Field Testing Technician Grade 1 Certification Program. Helps students to review, prepare and excel for this test. Basic principles of structural design. Describes for students the reasons for the methods, equipment, and structural details that are used in the various situations encountered on a building site. Worked examples. Illustrates for students how formwork calculations and concrete pressures are used.